Farrar, Straus and Giroux (BYR), 9780374305543, 336pp. 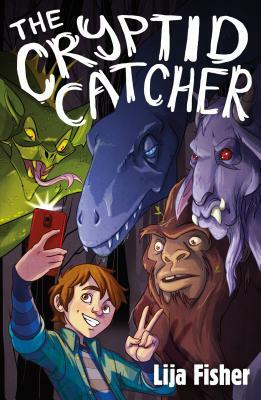 The Cryptid Catcher is the first book in a monstrously fun middle-grade duology by Lija Fisher about a boy who inherits a job hunting legendary creatures. After Clivo Wren's archaeologist father dies mysteriously, the newly orphaned thirteen-year-old finds out the truth: his dad was no archaeologist. He was actually a cryptid catcher, known for finding elusive beasts like the bloodsucking chupacabra. His goal: discover the one extraordinary cryptid whose blood grants immortality—before the knowledge falls into the wrong hands. The mission remains unfinished, and now there's only one person who can take the renowned cryptid catcher's place: Clivo. He may not know the first thing about monster hunting, but he's willing to give it a try—because anything beats staying home with his salsa-crazy aunt and her neurotic cats. Lija Fisher was born in Istanbul, Turkey and raised at the foot of the Rocky Mountains in Colorado. She graduated from the University of Colorado, Boulder, with a BFA in Performance Studies and has performed in regional theatres across New York, Florida, Alaska and Colorado. In 2017 she was a Writer in Residence with Aspen Words. Lija has lived in London, LA and NYC but now calls Colorado home. The Cryptid Catcher is her first novel.